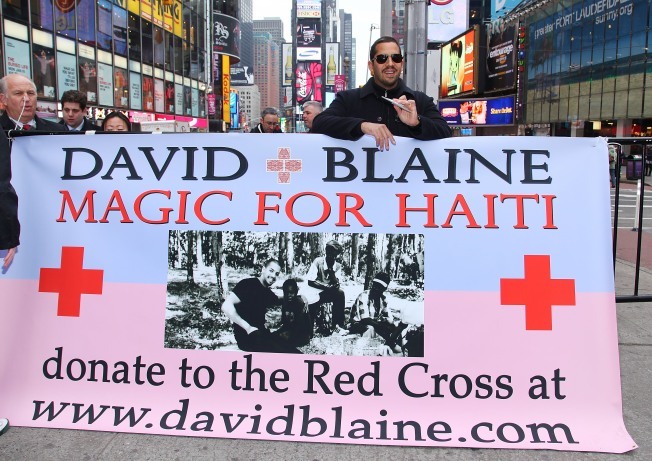 Illusionist David Blaine raises money for Haiti with a 72 hour Magic Marathon. Looking for more ways to help the Haiti relief efforts? Try one of these events, and have fun while doing a good deed. Description: The Hope for Haiti global telethon will be presented commercial free by MTV Networks. Along with musical performances, more than one hundred of the biggest stars will unite to support the cause. All proceeds will be split among relief organizations operating in Haiti, including Oxfam America, Partners in Health, the Red Cross, UNICEF, the Clinton Bush Haiti Fund, the United Nations World Food Programme and Yele Haiti Foundation. Description: Today is the last day to buy Alexis Bittar’s statement jewelry and have 100% of the sales go towards Haiti relief efforts through Catholic Relief Services. Visit for more details or to order. Description: Have an elegant night out at the UNICEF Haitian Relief Benefit at The Gates from which 100% of the $30 per person donations will go directly to UNICEF’s relief work for children. Free Svedka cocktails from 9-10p.m. To donate and add your name to the guest list, visit the UNICEF Haiti Relief Benefit page. Description: Enjoy brunch or dinner at Hotel Griffou, and 20% of all sales will be donated to the Red Cross. Description: Join The Epix Group and Forty Eight Lounge for the Haiti Relief Initiative. All door proceeds and 10% of sales will be donated to the Yele Haiti Foundation and the Red Cross. The minimum door contribution is $10, and donors who give $25 or more will receive a drink chip that may be redeemed at any time. Description: Shop ‘til you drop, and for a great cause. Urban Conscience is hosting Haute for Haiti, a silent auction of new, used and vintage designer items, including the designs of Prada, Vera Wang, Christian Dior, and more. The non-profit organization will donate 100% of all proceeds to Hope for Haiti and the Partners in Health foundation. Cocktails and small bites will be offered, and there is a $10 donation for all non-UC members. RSVP to urbanconsciencenyc@gmail.com for details about the event and its secret location. Description: The Benefit 4 Haiti makes for a good time with its more than 15 scheduled performers, special two hour keyboard karaoke, free food courtesy of Great Jones Cafe, Dub Pies, and more for early birds, and raffle and door prizes. Tickets are $50, and 100% of the proceeds will be split between Save the Children and Partners In Health.